According to HTC’s Mo Versi, the One (M7) on Verizon is scheduled to receive Android 4.4.3 this week, along with Extreme Power Saving Mode. 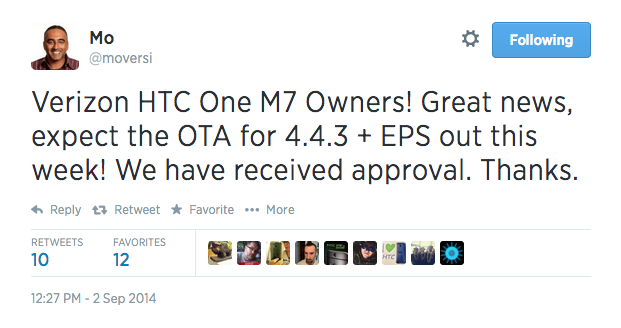 I can’t help but wonder if he actually meant the HTC One (M8), but he has yet to correct the Tweet. We will just have to go with it. I bring that up because the One (M8) for Verizon was supposed to get Android 4.4.3 in the middle of August, but HTC said it had been delayed until September. Seems odd that the original One would see the update first, but hey, it’s happened before…maybe. The update plugs security holes, optimizes all sorts of goodies, and again, brings Extreme Power Saving Mode, a feature that can extend the life of your almost-drained-battery for hours. Check out the update list for AT&T’s One (M8) here. Tuesday Poll: Product You are Most Excited for This Week?